Another look at the Nanpu Bridge. It was the first bridge across the Huangpu River in Shanghai and it's a little smaller than the Yangpu Bridge, which was built two years later. 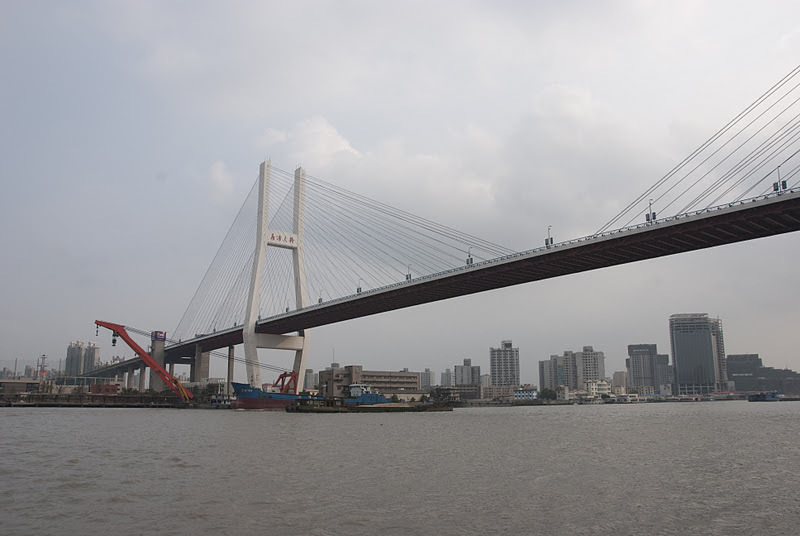 The Yangpu has a main span of 602 m and the towers are 223 m tall. The Nanpu has a main span of 423 m and towers that are only 150 m.
The two bridges are about ten km apart on either side of a big bend in the river. The two tunnels that go under the river are between these two bridges. You can see a tall building beside the bridge that carries pedestrians on and off the bridge deck. All of the bridges across the Huangpu have these towers surrounded by parks with gardens and benches. Shanghai's Bridges: Nanpu Bridge (2) by Mark Yashinsky is licensed under a Creative Commons Attribution-NonCommercial-ShareAlike 3.0 United States License.